Christopher Demczar, a fourth-year biomedical sciences major with a concentration in exercise science, tests his aerobic capacity in the RIT Fitness Lab alongside Seann McArdle, right, Fitness Lab and Wellness Coordinator. What does it mean to be RITFIT? 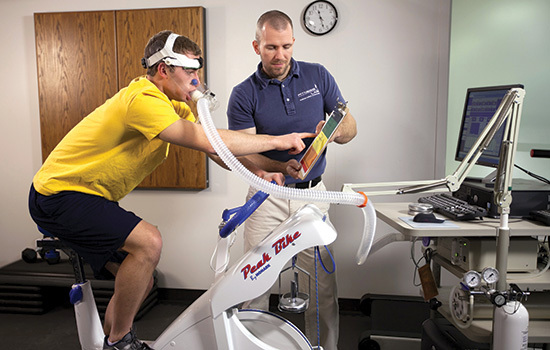 Seann McArdle, RIT Fitness Lab and Wellness Coordinator, is trying to answer that question through a system of field tests he created to measure improvements in the physical fitness of RIT students. Student Affairs rolled out RITFIT for the first time this fall. Students enrolled in wellness classes took the benchmarking tests early this semester to record their aerobic capacity, flexibility, and muscular strength and endurance. A follow-up evaluation at the end of the 15th week will quantify changes. McArdle based the RITFIT tests on strength standards, normative data and previous studies of college students. The prior studies, though useful, do not accurately reflect students at a technical university living in a sedentary era, he notes. The RITFIT initiative strives to address physical wellness, one component of a holistic approach the Student Wellness program promotes on its website, www.rit.edu/studentaffairs/wellness. According to Bill Brewer, director of the exercise science program, College of Health Sciences and Technology, 80 percent of adults lack the fitness level necessary to provide health benefits and reduced risk of disease. “RITFIT” might ring a bell for those who used the Student Life Center in previous decades. In 1985, the center provided health-and-fitness screening to faculty and staff through a program with the same name. Today’s RITFIT and the Fitness Lab are a student-wellness and academic resource. Faculty and staff are invited to access the lab through the Better Me Employee Wellness program, www.rit.edu/fa/betterme. The Fitness Lab website, www.rit.edu/healthsciences/fitnesslab, offers students online scheduling and a menu of services, including fitness assessments and exercise program creation, available in the lab and in the Center for Recreation and Intramurals. Services offered through the Fitness Lab are an outgrowth of the facility’s primary function as an exercise physiology laboratory. The lab supports the exercise science program in CHST and was funded, in part, by Excellus and the Center for Bioscience Education and Technology. McArdle, an adjunct professor in CHST, conducts the exercise physiology labs. He and Brewer hope to create classes that train interested students to work in the Fitness Lab and conduct RITFIT tests.